A​t Bait House Charters we will make your Clearwater fishing charters a great experience. Clearwater fishing charters at it’s finest! Come and see for yourself why our charter customers rate our inshore fishing charter and offshore fishing charter trips the best that Clearwater has to offer and why they keep coming back! Book inshore fishing charters out of Clearwater Beach or Tampa where you can fish for monster tarpon, snook and redfish. Inshore fishing charters fish the backwaters of either Clearwater or Tampa. You can expect calm water and short runs to the fish. Experience an offshore fishing charter trip out of Clearwater Beach for the world’s best bottom fishing for grouper, snapper, hogfish and many others, including offshore trolling charter fishing for kingfish king mackerel and other pelagic species. Offshore fishing charters run out varying distances based on the trip length and where the fish are located. We can do special middle-grounds charters (70-90 miles out) and elbow charters (90-100 miles out). We also offer shark fishing charters. Sharks can be caught year round but spring and fall are the best times. Frequently caught sharks include bull sharks, black tips, hammer head, bonnet head and tiger sharks. Book online using SquareUp app. Select your fishing charter type, date and time; and then simply enter your contact details and payment information to reserve your fishing charter. Upon booking, Square will automatically create an account for you with Square Appointments. 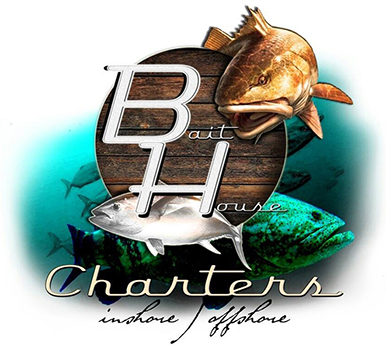 You can sign back into Bait House Charters using your mobile number at any time. The boats include Yamaha 250 (Pathfinder) for inshore fishing charters and Twin 300 Suzuki Outboards (Dusky) for offshore charters that will get you to the fishing ground quickly and safely. All boats are equipped with all USCG safety gear including EPIRBS (Emergency Position Indicating Radiobeacon), GPS (Global Positioning System) etc. Visit our photo gallery to catch a glimpse of some of the memories made throughout the years. If you are interested in having your personal photos from your Clearwater, Florida fishing charter posted on our website please email them to Brad@BaitHouseCharters.com. We look forward to seeing you out on the water again soon! ©2019 Bait House Charters | All Rights Reserved | website designed and maintained by Blueway Design, Inc.